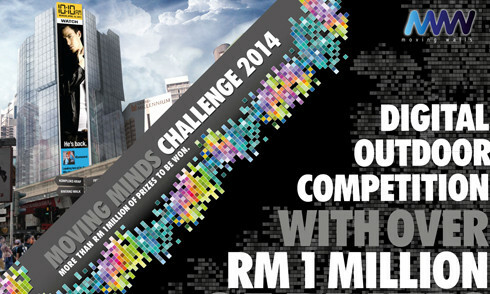 Moving Walls has launched its Moving Minds Challenge 2014, providing participating creative agencies the opportunity to showcase their creativity at its Bukit Bintang 200ft solid-state LED screen. The idea behind the competition is to “create magical consumer experiences, experiences that move the hearts and minds of consumers,” which is Moving Walls’ motto and vision. By having the contest run in one of the most prestige advertising locations in Malaysia – Bukit Bintang –it hopes to recreate the NY Times Square out of home experience for Malaysian consumers. Creative agencies are invited to submit their best digital out of home campaigns and to entice entries, the winning agency will be given airtime run for 12 days at the centralised location on its 200ft LED screen estimated to be worth over RM 1 million. The competition is promoted on its mircrosite as well as its social media platforms, Facebook and Twitter. Creative inspiration can be found on its YouTube and competition guidelines are on its website. Registration ends 22 November and submission will be due 10 January, followed by execution from 14-26 January 2014. The competition caps off at 20 brands and slots are given based on a first come first serve basis. After recommendations by friends and family, TV advertising is the most influential medium for convincing consumers of new product..
"Integrated marketing isn’t limited to definitions and sacrosanct methodologies that guarantee success." ..